Are you seeking a high-quality dive watch but have a limited budget? If the answer is YES, then you have come to the right place! Here are my picks of the Top 10 best dive watches for men under $300. Although I cannot say for sure if that all of the watches in this list are top-quality, but I can guarantee that every timepiece mentioned below is worth the money. You will find plenty of dive watches in the market that cost much more than the ones reviewed here, but are not as good. This is the bestselling watch in the Invicta pro diver series due to its outstanding fineness and reliability at such a reasonable price. Its design takes inspiration from the Rolex Submariner, so it’s difficult to tell the difference between the two watches at first sight. The 8926OB is not aesthetically distinct, but it’s a nice-looking & dressy watch which can compliment a wide range of outfits. The black dial and bezel make the watch suitable for any occasion, whether casual or formal. Sized at 40mm, the 8926OB is not too large and weighty on your wrist – just enough to give you a solid feel. Beating inside the watch is the durable workhorse, Seiko NH35A automatic movement. Despite being just an entry-level auto movement, the NH35A is fairly accurate in operation – you should expect it to run off about -10,15/+10,15 seconds per day – not bad at all I say! With this Seiko NH35A movement inside, the Invicta 8926OB deserves your trust in its quality. The gold-plated bracelet is easy to get scratched, be careful when using it! The Invicta 8928OB is a counterpart of the 8926OB mentioned above. Hence they share the same technical properties, but with very different styles. Although they have similar shapes, the 8928OB poses a flashier look due to its gold-plated bracelet and bezel. The plating is the main factor that lends a classy appearance to the 8928OB. Moreover, the royal blue on the dial and the bezel insert make for some interesting view angles under right light conditions. The 8928OB’s face is not muted like that of the 8926OB; it is reflective when being exposed to a strong light source and radiates some purple flares out of the bright blue background. In my opinion, the 8928OB is more of a dress watch than a dive watch despite its high water resistance rating and luminescent parts. Don’t get me wrong – the watch is equally suitable to play the role of a diving tool, but many people have bought it just because of its stunning look. Since the watch is so lustrous, it’s not a proper choice for everyone, especially people with dark skin. The gold-plated bracelet will accumulate minor scratches overtime, therefore you better treat it a little gingerly. The hand wind mechanism may require a learning curve. Orient’s success with Mako begged several improvements and that is exactly what they did. After a wide positive acceptance for Mako and Ray, the Mako II has brought in a lot of upgraded features that deserve recognition for their qualities. There are 2 distinct dial colors for the Mako II, both of which are very popular on their own palettes. There is the radiantly deep blue dial and the charmingly charcoal black dial to choose from. A significant improvement that many have sought for is the new F6922 movement feature which greatly improved compared to its predecessor’s 46943 movement which is slightly off at about 9 to 10 seconds a day. The F6922 is also self-winding, able to be hand-wind, and is hackable. The dial features a set of numbers that adds to its charm of an elegant and mature look fit for most people’s fashion choices. The look of both colors of the watch remain as fashionable as ever. The stainless steel band and its clear mineral crystal are hard to ignore. The Mako II perfectly fits into its owners’ wrists and adjusts towards their style and not against them. The various improvements for Mako II justify its higher price tag. However, considering its quality and elegance, it is significantly more affordable compared to other higher end watches, making this model a very popular option for its uncompromised features and style. The Mako II may be a bit small for some people as the model comes at 41.5mm in diameter. Although this model fares well, many would opt for a bigger size to avoid making the watch look small and tight on the wrist. With this, the overall composition of the Mako II is still a great option for a watch that has high quality features at a low price. It is comparable to even other high-end watches but remains a reachable and fashionable option for most users. In my opinion, this is one of the best affordable dive watches in the market now! The watch bezel may be stiff for some people. 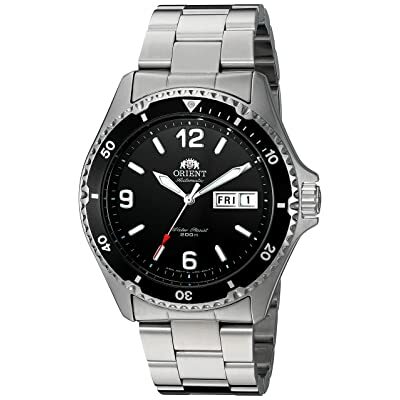 Orient’s Ray II has made a significant change since its predecessor Ray went out to the market. Understandably comparable to Mako II, this watch has its own charm with its dial, a unique charm that both watches have despite its different looks and a 2-polished-line bracelet that adds to its design. There are 2 similarly popular color palettes for Ray II. The first is a deep blue color that is both classy and elegant. The second version is a sleek black color that has a sharp and straightforward look. Both watches present their individual charms with a difference in color through a similarity in kind. As most people have requested, the new F6922 movement of the watch is a major improvement that moved forward from the original Ray’s cal. 46943 movement. The previous Ray had 9 to 10 seconds off per day so the F6922 is a major improvement towards accuracy. It has automatic winding, an option for hand winding, and is hackable. It improved its movement where many have reacted and now while a lot of people appreciate the change, some find difficulty immediately adjusting to the difference. The charm of its dial remains as a sleek look compared to having numbers for its set. It’s a more unique look that also fits with different styles that its user might prefer. The stainless steel band of the Ray II is still a great fit for its clear mineral crystal. It is also noticeably priced higher than the original Ray. But with this difference comes a new set for the Ray II, improving many of its features that required necessary upgrades while maintaining high quality of the watch as can be comparable to other high-end watches. Comparing the Ray II to Mako II, the Ray II’s dial is not numbered but instead represented by circles at the hour area, and the bracelet of the Ray has 2 polished lines. Overall, the Mako II presents a more mature look and a stunning straightforward style, while the Ray II presents a sleek and unique play on details with the dial and the bracelet. There are still some who have yet to adjust with its bezel, but getting used to it by continuous wear will make it easier to use. The overall design of the watch and its improvements make it a great catch that is surely one to remember for its high quality and relatively modest price. Its thick bezel frame is assembled a tad higher than the hardlex crystal in order to protect the watch face from accidental bumps underwater. This structure is very practical because it only takes a small crack for the water to seep inside and damage the whole watch. 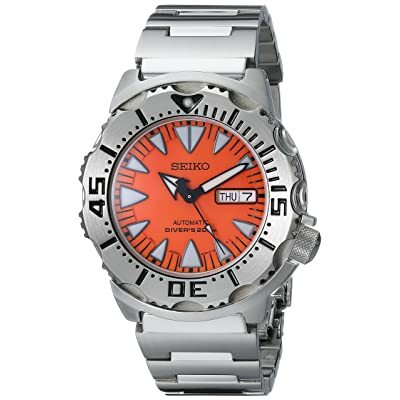 It is ISO6425 – certified, which means it meets all the standards required for a true dive watch. Even though Invicta and Orient pieces may also do the job well, they do not have any certification to back their claim. 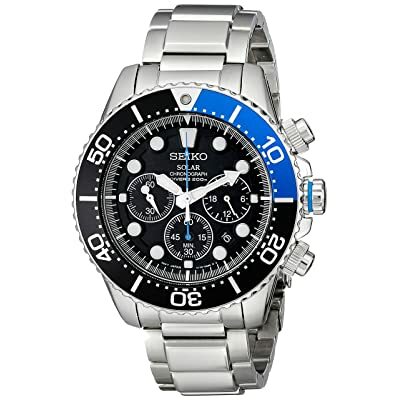 In short, Seiko’s products are more trustworthy in terms of diving function. The breakthrough LumiBrite technology provides superior lume in the dark. A bright and long lasting lume is indispensable for a fully featured dive watch. That being said, the SKX007K2 still can serve multiple purposes. It’s just not as dressy as Orient’s and Invicta’s diving pieces. Due to its versatility, the SKX007 is one of the best dive watches for the money now, along with Orient Mako, Ray & some other Seiko solar-powered diver’s watches! The SKX007K2 features the prestigious automatic movement of Seiko – the 7S26. The durability and reliability of this movement has been proven overtime. It’s somewhat similar to the 46943 caliber of Orient in terms of performance. They are both self-winding and non-hacking entry-level movements whose qualities are at par with many other high-class products. The SKX007 is available in 2 versions: the rubber strap and the metal bracelet. In case you don’t like the black tone of the SKX007K2, you can opt for the SKX009 which features a dark blue dial and a Pepsi bezel. Update: Recently the SRP 309’s price has increased to over $300. This watch used to be categorized in the SKX series (called SKX781) and featured the same 7S26 caliber as the SKX007. However, since its consumer market is too distinct from the rest, Seiko decided to create an entirely new product line for it, called the “SRPs”, and its new product code is certainly SRP309. Hand winding – you don’t need an auto winder, or have to wear it at least every other day just to keep it operating. Hackable – for precisionists who want their watches to keep perfectly proper time. 24-jewel – this is not a direct indicator of anything, but the number of jewels can show the caliber’s sophistication to some extent. The 7S26 only has 21 jewels, you can assume that its structure is simpler than the 4R36. It is understandable that the significant functional improvements come at a higher price, but I think it’s worthwhile! When it comes to the body finish the SRP309 is literally an armored tool watch, hence it has got such a “lovely” name – Orange Monster. This rugged appearance lends a solid feel to the SRP309 as a sport watch, but it simultaneously keeps the SRP309 from being an elegant watch. I think that’s why Seiko separated this watch from the SKX series, because the other SKXs have dressier appearances. This timepiece is quite heavy due to its solid stainless steel body. 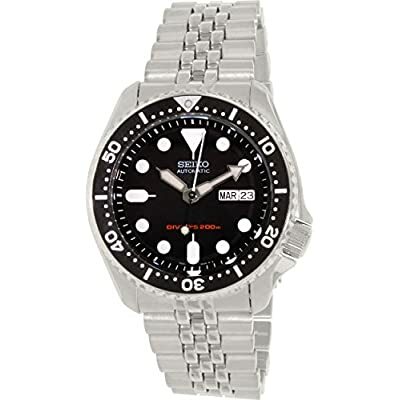 For those who want a lighter watch, Seiko also offers a rubber strap version – the SRP315, but this variation has some changes in tone, like a black chapter ring and a matte ion-plated bezel. With the 48mm case size & 18mm thickness, this is not a small watch by any means. Owing to its size, the giant BJ8050-08E gets its name, EcoZilla, from the cinematic monster Godzilla. 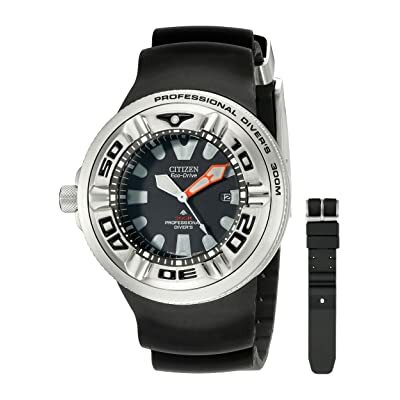 It is the biggest and the most boisterous member in the family of Citizen Eco-Drive dive watches. As you can see from the picture, this beast cannot be treated as a fashion accessory – it is only meant for sporting use. Everything is well-protected, especially the screw-down crown on the left is positioned so to avoid accidental bumps, because the right side is where the watch gets most physical abuses. The BJ8050-08E features a light-driven quartz movement made by Citizen, called Eco-Drive. The Eco-Drive movements have some technical refinements over previous light-powered calibers, like they no longer need conspicuous solar cells. In terms of precision, these Eco watches are superb as 4 seconds per month of gain or loss is more than acceptable. Similar to the Seiko dive watches, the Citizen Eco-drive pieces also have the ISO6425 certification. That’s why Citizen dares to mark the BJ8050-08E as Professional Diver’s watch. Since the EcoZilla is an ultimate heavy-duty watch, its water resistance rating is up to 300m, 100m higher than most Seiko entry-level dive watches. At the moment, the BJ8050-08E is only available in rubber strap, but you can opt for an aftermarket jubilee bracelet. I bet that the watch would look much cooler with a metal band. 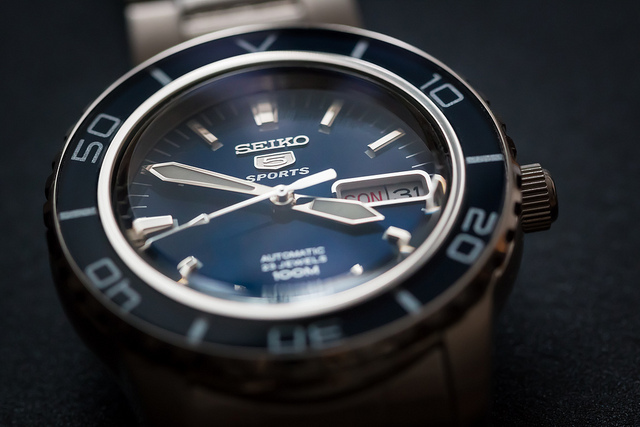 Another piece from Seiko – the No.1 watchmaker in Japan. This time it’s the SSC017, a solar-powered chronograph dive watch, not an automatic piece. It will be unfair to compare this watch with the Citizen BJ8050-08E mentioned above, as they are totally different in terms of usage purpose. While the BJ8050-08E is a downright dive watch, the SSC017, on the contrary, is a versatile timepiece. It holds such a dressy look for everyday use, and the chronograph function is not for diving either. The watch looks really nice when you hold or wear it on your wrist – the picture doesn’t do justice to its style. The stark white hands and hour marks contrast well with the matte black background, giving the watch superior legibility. Even with 3 subdials in the lower half, the face still remains textured and clear, not visually crowded. The beveled bezel is not as prominent as that of the SKX007 or SRP309, so the hardlex crystal is not well-protected. In this case, Seiko has chosen exquisite appearance over security. But bear in mind, this is a versatile timepiece, not just a dive watch. This watch looks extremely handsome on a striped textile NATO/Zulu strap and compliments a wide range of outfits. The SSC017 features the V175 solar-powered movement with chronograph function. This caliber is extremely reliable & durable and there is also no need of battery change. Casio is known for making the best affordable quartz timepieces. In the field of analog dive watches, Casio is still not on a par with other Japanese watchmakers yet. 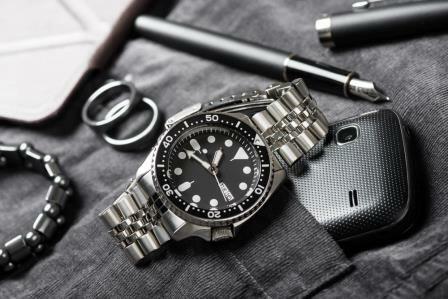 However, they’ve already successfully launched some bestselling budget men’s dive watches, such as the MDV106-1A. 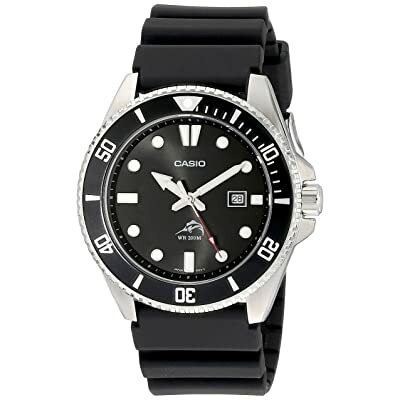 Firstly, I want to mention that the Casio MDV106-1A is not a scuba diving watch – it’s a desk diver’s watch whose main purpose is to be a casual waterproof timepiece with diving style. Despite the statement of “ WR 200m” on the watch face, there’s no guarantee for the watch’s water resistance rating. You shouldn’t expect such a low-priced timepiece like the MDV106-1A to be able to go on a scuba diving adventure with you. Since the watch case is very well-protected, the MDV106-1A certainly has a much higher water resistance rating than ordinary watches, but not enough to be considered a true scuba dive watch. The watch dial has a simple design but looks appealing in its own way; every detail on the face and the bezel contrasts well with the black background, while the metal-bordered hands add some interesting flare to the watch. The polished middle case lends glossiness to the MDV106, making it look pricier than what it actually costs. In case you don’t like the stock rubber strap, you can opt for an aftermarket leather strap or a fabric NATO/Zulu; the case suits well with all kinds of bands. The last one in this list is an Invicta quartz timepiece, the 8932 pro diver. 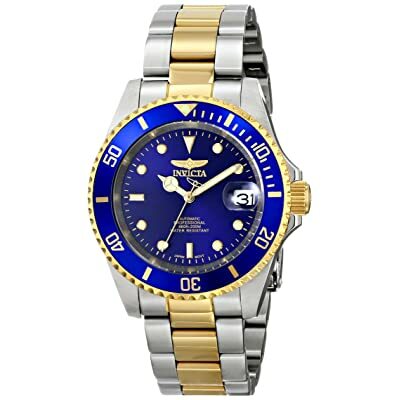 Along with the 8926OB & 8928OB, the 8932 is one of the bestselling Invicta pro diver watches in the affordable price range. Sized at 37mm, this watch is a tad smaller than its automatic counterparts. Its scalloped bezel and thin metal bracelet (17.5m) give the watch a unisex appearance. The 8932 looks more of a dress watch than a sport watch due to its exquisite external design. 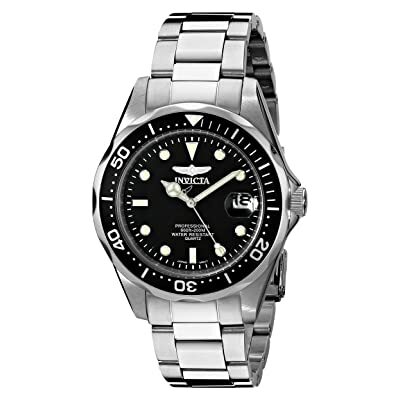 Despite being listed in the Invicta pro diver series, the waterproof capacity of this watch is inferior to that of the Invicta automatic pro divers, because it does not feature a screw-down crown. The crown’s security is the most vital component in deciding the water resistance rating of a watch. Although the 8932 can’t be considered a downright dive watch, it is able to operate well underwater without any problems. Don’t go diving with it, as it’s actually a desk-diver’s watch, not a “pro diver’s”. 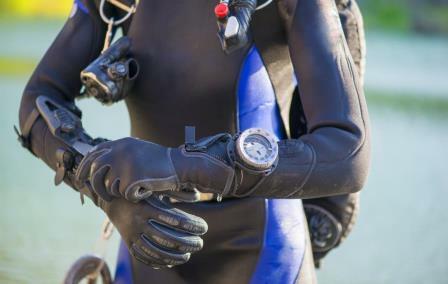 There is no best choice among this list as each dive watch has its own pros and cons. Therefore, you must decide what your priorities are before making the purchase. Some pieces hold the first and foremost function as a downright tool watch, while others are designed to be versatile timepieces. The rest are mere casual watches with diver’s style. What kind do you want? And how much are you willing to pay? Set your priorities first so you don’t go wrong! Dive watches are among the most sought-after products in the timekeeper market now. Take a look an online watch store and I bet you’ll get lost in a maze of choices. 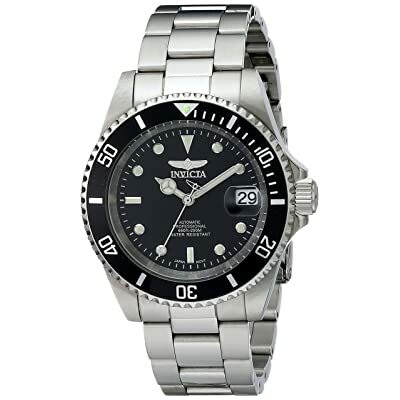 Following are some main aspects that I often research on a potential dive watch to prevent purchasing a wrong product! Before purchasing anything, we have to make clear about how much we’re willing to pay, and what to expect from a product at that price, it’s a matter of course. However, in the watch market, high price doesn’t always mean high-quality. Some brands are so famous that they can easily charge their customers a very high price for a mediocre item that they outsourced somewhere. This is the power of branding! Although wearing a watch from a prestigious producer is very cool, you should make product-quality your No.1 criterion. It’s not only save you a good amount of hard-earned money, but also help you make a good impression in the eye of a watch fancier. He/she knows that the watch clinging on your wrist is a good choice, and you are not a victim of overpricing tricks. When you stumble across an attractive watch, firstly scamper through its customer reviews, then move on to some other products of the same producer, in the same price range, to know what is the overall opinion of purchasers towards this brand. From my own experience, Japanese watchmakers (Seiko, Citizen, Orient,etc…) are among the most reliable brands in the budget price range. Their craftsmanship is admirable, even the cheapest watch is very well-made. Spend some time on researching before making your purchase, and you’ll find lots of good choices to choose from, both in terms of brand-recognition and quality. Type of movement – Know the pros and cons! As mentioned in my recent post, wristwatches nowadays have various kinds of movements, each of them applies a whole different timekeeping technology. I’ve seen lots of buyers complaining about how their mechanical automatic watches keep running off over 3 – 5 minutes per month. Let me tell you something…a traditional mechanical watch, which is as nearly accurate as a 10-buck quartz piece, can cost you hundreds of thousands. Today’s mechanical watches are not made for accuracy. If all what you want is just a time-telling tool, opt for a 10-buck Casio piece, it can get the job done much better than a luxury Rolex. People keep choosing mechanical watches no matter how imperfect & inconvenient they are because they’re pieces of art, real “time-machines” which can last for decades with little service. A mechanical piece requires much more effort and time to finish than a modern quartz. That’s why most luxury watches are of mechanical type, because watchmakers find it’s hard to charge customers over $1000 just for a well-made case & band, they need something more complicated, and that’s the watch’s heart. The 2 most common types of movements for dive watches are: mechanical, quartz. With quartz, we have ordinary battery & solar battery (doesn’t need replacing). With mechanical, we have self-winding & hand-winding types. You have to know the pros & cons of each movement type before making the purchase. Design- What is your using purpose? A dive watch can be a mere fashion accessory (desk diver’s watch) or a diving tool. Lots of times, it can play both roles (versatile watch). What is your using purpose? You mainly use your dive watch underwater? Or you love wearing a diver-style piece on a daily basis? You can wear an Invicta 8928OB or an Orient Blue Mako with suit, it’s totally acceptable. But other people would find it so strange if you wear a Seiko Monster in a party or some kind of formal occasion. They’re all men’s dive watches, but their designs make them suitable with different uses. A fully featured dive watch can offer you the best using experience underwater, because it’s made for scuba dive. But they’re often rugged-styled, not so fashionable. Other diver’s watches have dressier appearance, but they must sacrifice some practical features in order to increase the elegant look. Certainly, there’re some watches that can get the best of both worlds, I often call them “versatile watches”. You can use them underwater or on-land without any problem, they’re built for scuba-dive but still dressy enough for everyday-wear. However, in the budget price range, watchmakers usually cut corners to make them “versatile”. You should accept it as long as the watch doesn’t lack the most important thing you expect. Weak lume is the most common flaw of “versatile dive watches”, but it’s not vital, so wearers keep choosing them. However, if bright & long lasting lume is among your priorities, Seiko & Citizen can offer you versatile watches with outstanding lume. Above are the 3 things I always consider carefully before buying a new dive watch. Your criteria may be a tad different to mine, but in essence, if your targeted watch is not a luxury piece, it certainly has some imperfections, you should make clear whether you can accept its flaws or not! A good watch has many big advantages compared to its tiny imperfectness. For those who want information about the watchmakers mentioned in this review, I have summarized some highlights of the brands here! 1969 – Seiko introduced the first quartz wristwatch, Seiko Astron, which initiated the quartz revolution in the 1970s. 1984 – Kinetic movement – a quartz caliber which is powered by body movement like an automatic. 1992 – LumiBrite technology – harmless luminous paint which offers superior lume in the dark, much better than conventional fluorescent paints. You will notice that all of the Seiko dive watches get a “breaking wave” logo engraved on the case back. This image is actually inspired by a masterpiece of Katsushika Hokusai – The Great Wave off Kanagawa (Kanagawa Oki Nami Ura). More detailed image means higher ISO diver rating. This small company was founded in Tokyo in 1950. Orient is now an independent subsidiary of Seiko the Giant. While Seiko emerges as the No.1 innovator, Orient, on the other hand, is famous for their admirable craftsmanship. Each Orient watch embodies attention to detail. At the time of the quartz revolution, Orient decided to stay with mechanical timepieces. This traditional approach to the market helped differentiate Orient from many other competitors. If you notice, all Orient timepieces have a vintage look to some extent, regardless of the type of watch. 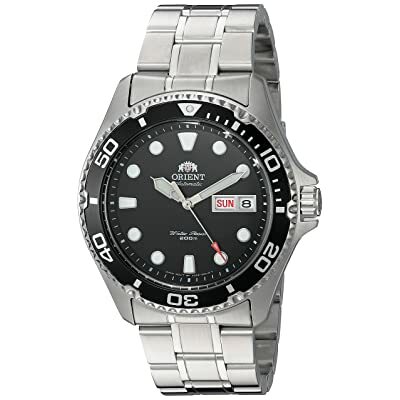 Recently, Orient has also been manufacturing quartz wristwatches with calibers provided by the parent company – Seiko. The Orient quartz wristwatches have the same designing cues as the automatic ones, but people keep opting for their autos because the brand is known to make their automatic movements in-house – “100% made in Japan”. Moreover, their calibers offer a superior quality that few watchmakers can stack up against. Founded in 1930, Citizen is the second best-known watchmaker in Japan after Seiko. The slogan “The Fusion of Technology and Beauty” is Citizen’s commitment on both product designing and technical function. This principle is clearly demonstrated through Citizen’s sport watches. Its Eco-Drive dive watches are examples of their design and technology fusion, as they are fully featured but still remain fashionable, except for some heavy-duty watches. Citizen is among the biggest watch-component suppliers. Citizen’s Miyota movements are widely used for both authentic and fake watches due to their competitive prices along with high quality. The company name – Citizen – is derived from the vision of its founders – to produce high-quality watches with affordable prices for everyone. The company’s name means “Invincible” in Latin. Founded in 1837 in Switzerland, Invicta was a budget brand whose products were popular all over the world, until the quartz revolution of the early 1970s. The company’s situation kept going downhill until it was purchased by a US investment company in 1991. Invicta is not directly involved in watch production – it designs watches but outsources the manufacturing to third parties, mainly in China (case, bracelet) and Japan (movement). Invicta also has some Swiss-movement models available, but they certainly cost more than their Japanese-movement watches.